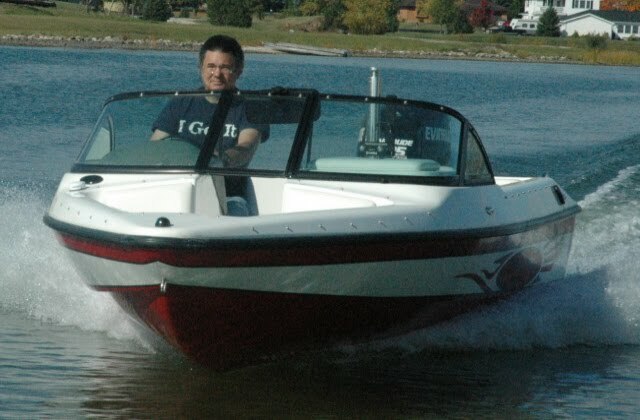 Dyna-Ski 20' Closed Bow boats usually are powered by two or three outboard engines. Ski teams mainly purchase the 20' Closed Bow models for towing skiers in their shows. In the past couple of years we have set up a couple 20' Closed Bows with only one engine for ski teams. 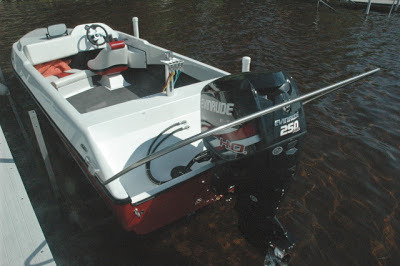 The Crivitz Ski Cats ordered a new 20' Closed Bow with a single Evinrude 250 HO and I-Con (digital) controls to replace one of their old inboards. This new Ski Cats boat has a three color hull (red,white & red) to match their older new style Dyna-Ski twin. I got the chance to drive this rare Dyna-Ski boat for a couple hours the other day. I expected it to be pretty good but frankly I was surprised by how powerful (4 blade 15 pitch prop) and smooth the combination is. When the throttle is punched from a standing start the rear facing rider has a hard time staying in their seat! The boats bow stays down and there were no sand bags under the bow. 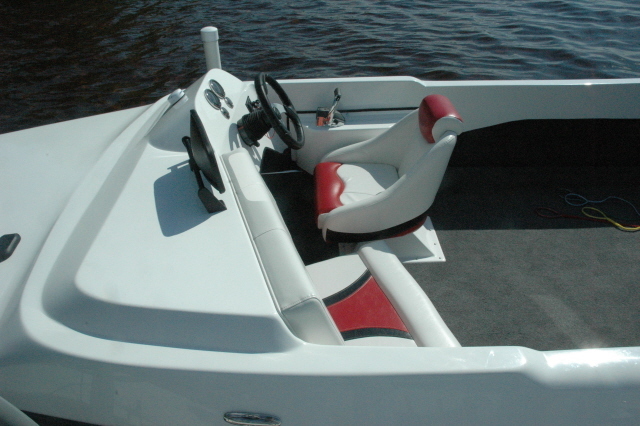 The amount of power available requires a fine touch for pulling single skiers smoothly off the dock. The I-Con control makes this easy. The Dyna-Ski required no motor trimming (up) for speeds from 0 to 40+ mph. There was little if any bow steer at 40 mph on the GPS Speedometer. A slight trim up at 40 mph did result in a slightly higher speed though. Not having to trim at all will make it easy for an experienced inboard driver to move to an outboard powered Dyna-Ski I suspect. The Dyna-Ski has a very nice wake for a barefoot pyramid with the motor trimmed all the way down or slightly trimmed up. The 40+ gallon gas tank was left in the standard front mounted position as the ski team wanted the flexibility to turn this boat into a triple in the future. In the other single motored Dyna-Ski 20' Closed Bows we put a smaller gas tank in the rear with no tank under the bow. The gas tank was full when I was driving the boat around. 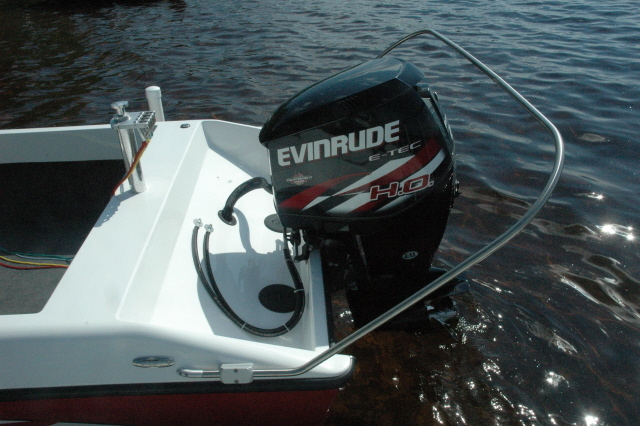 The Evinrude I-Con controls are so smooth. It is easy to set and hold any speed from zero to wide open with the digital system. The single binnacle control has adjustments for tension of the speed control portion and also for tension going into/out of gear. Very sweet indeed! Top speed observed was around 48 MPH on the GPS with the 15 pitch prop. 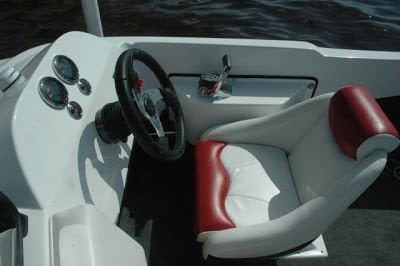 All the I-Con system needs is GPS speed based cruise control or a "Perfect Pass" type of speed control software to make the digital control system perfect although with 250+ horsepower and a four blade 15 pitch prop the speed is rock steady for most skiers already. The Crivitz Ski Cats wanted to be able to change this boat into a triple some day so setting it up as a single means no transom holes will need to be filled if the boat is indeed made into a triple as the center engine is already in the proper mounting position. The rope guard is mounted in the standard position used for a twin or triple. The difference between the twin and triple is the shape of the rope guards themselves not the mounting location. 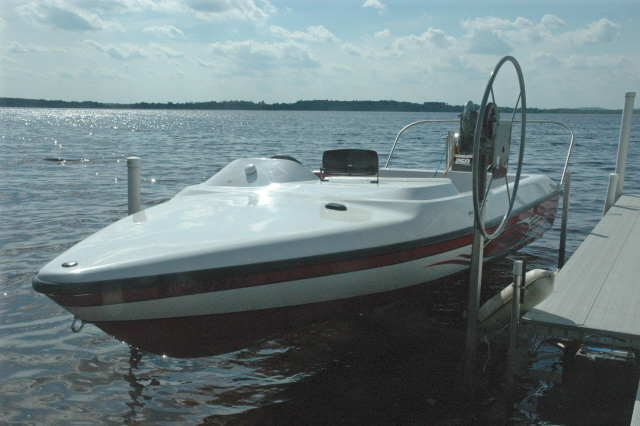 We also changed the older Dyna-Ski twin over from twin Mercury 200 hp OptiMax motors to twin Evinrude 250 HO motors. 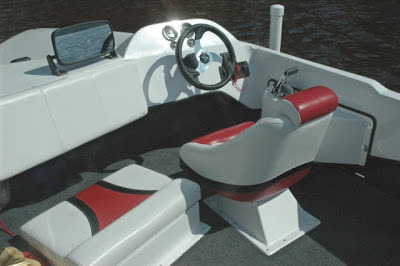 The 'Cats went with the Evinrude standard twin binnacle cable shift and throttle system on the older boat. The repowered boat has four blade 17 pitch props. The Dyna-Ski 20' Closed Bow has an optional windshield and full interior. A rear mounted swim platform or two could be added although getting in the back of the boat with the large rope guard would not be easy perhaps?